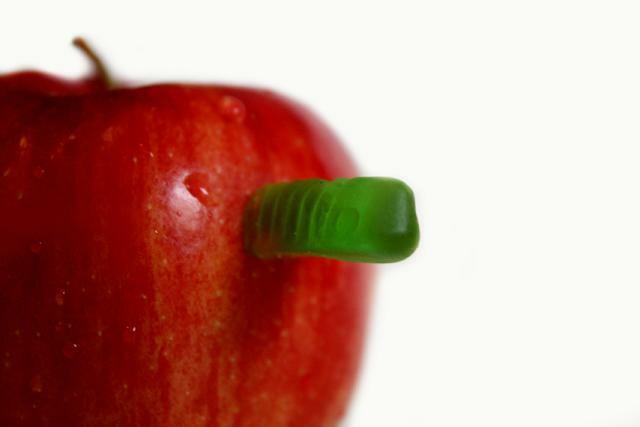 How Do Worms Get Into Apples? Have you ever taken a bite of a nice, shiny, juicy red apple, only to discover that you were not alone in enjoying your snack? Hopefully, what you saw was a whole worm, because you know what it would mean if you found only half! The worm nesting inside that apple did not have to crawl inside it to make the apple its home, for the worm was born there. Apples are not only worms’ homes, but their supermarkets as well. Here’s how it all happens. During the summer, small fruit flies can be found buzzing around apple orchards. These are called apple maggot flies. Each female finds herself a sweet smelling apple that is ripening and lands on it. Using a small, sharp, hollow tube on the underside of her body, the fly stabs a small hole in the fruit. Then she releases her eggs, which slide down that hollow tube into the apple. Soon afterwards, the eggs hatch into tiny white worms, in no way resembling their mother. These worms are called railroad worms. All during the summer and into the fall, the always hungry worms nourish themselves by munching tunnels in the apple. When the apples are ripe in the fall and drop from the tree, the worms crawl out and burrow into the ground. There, a hard outer skin develops on each worm’s body. This hard skin becomes a winter home for the worm in the ground. It is inside this winter home that the worm becomes an apple maggot fly. The following summer, the fly breaks open the skin, emerges, and begins to fly about the orchard. Then the entire process begins all over again. How Do Birds Detect Worms In the Ground and Do Robins Search For Worms By Smell or By Hearing? Where Do Apples Come From and When Were the First Apples Brought To America? Do all Apples Float in Water and Are there certain types of Apples used for Bobbing on Halloween?